He went to his library. He sat reading for a few hours. Then he stopped. He stopped short, without reason, in the middle of an important sentence. He had no desire to read on. He had no desire ever to make another effort. Nothing had happened to him—a happening is a positive reality, and no reality could ever make him helpless; this was some enormous negative—as if everything had been wiped out, leaving a senseless emptiness, faintly indecent because it seemed so ordinary, so unexciting, like murder wearing a homey smile. Nothing was gone—except desire; no, more than that—the root, the desire to desire. He thought that a man who loses his eyes still retains the concept of sight; but he had heard of a ghastlier blindness—if the brain centers controlling vision are destroyed, one loses even the memory of visual perception. I’m surprised that I’m finding time to fiddle with my watercolor sketching, being absorbed with a novel I began reading at the end of last week. I am about 500 pages into it and cannot seem to put it down, yet somehow I’m still preparing my classes, grading, writing in my journal and experimenting daily with watercolor in my studio. I don’t know how this is all happening, but I’ll accept that gift with gratitude. This is a small watercolor that I began while sitting in a festival booth a few weekends ago. I forgot about it until last evening and decided to push onward with it. I’ve just now peeled away all the masquing, so there are quite a few raw areas that now have to be doctored and detailed. It looks as though the painting will have to be abandoned on my drafting table for the rest of this night, however. I am moved by the words I’ve posted above from the novel I’m reading. My Advanced Placement Art History students challenged me last week to read it because of our recent studies in twentieth-century architecture. I’m finding to book to be very engaging, and am really enjoying what I read of the characters. I shuddered this morning, before dawn, as I read this text. The words are spoken of a successful New York City publishing mogul who at age fifty-one comes to this flat level of existence. I would hate to come to that state of mind. Currently I find myself wishing I could split into two or three persons so I could have time to pursue every challenge that interests me currently. I cannot understand a sentiment of emptiness, of vacuity. I have to leave soon for a social function this evening, and knowing that when I return I will be crowded to finish grading before bedtime, and probably have zero time remaining for reading this novel or working on this watercolor already frustrates me. I cannot understand one’s being bored, or feeling that life has reached a stage of non-purpose. To the contrary, my life has always had more details than I could ever chase down and solve. I paint in order to remember. 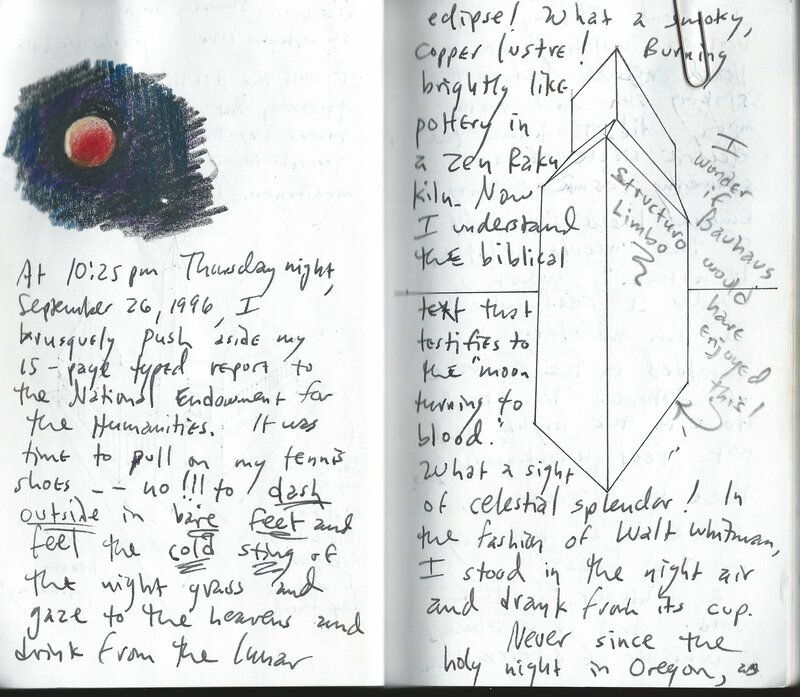 I journal when I feel alone. I blog to remind myself that I am not alone. Texas temperatures were O.K. Saturday, though the winds were fierce. I decided to drive to nearby Stovall Park for an exercise walk, taking along a good book to read, my journal and my watercolor supplies. I only managed 3/4 of a mile when I saw it–a solitary tree in the natural grasses, throwing a canopy of shade below and filled with dynamic color. I couldn’t resist. I jogged back to the Jeep and retrieved my supplies, and found a picnic table near enough to the tree that I could sit, relax, study, and not think about time or deadlines. I am reading The Fountainhead with great pleasure, and read extensively from the book at my picnic table while waiting for portions of the watercolor sketch to dry and trying to make decisions on how to execute the compostion. I posted the text above because it made me laugh out loud. I do laugh at myself when I chip away at a watercolor, with no clear cut idea of how to accomplish the objectives I’ve set up. For instance, I saw in this arrangement an incredible range of greens–warm, cool and neutral. And I took my time, trying in earnest to separate the background field from the tree leaves and the grasses below, both in and out of shadow. I divided my time between drawing, painting, masquing, reading this book and writing in my journal, and taking refresher walks. By the time the day had passed, I had walked over three miles, came to the end of this sketch, and covered another 125 pages of the book I’m enjoying. And it turned out to be a beautiful, rewarding day. Looking over the watercolor now, I believe I solved a few problems, and created some others. I am intrigued at the plein air challenges I’ll face in nearby Waxahachie, Texas beginning this weekend. And I’m glad I had a Saturday to work on this one. It’s been awhile (Spring Break) since I tried my hand at a plein air subject. high in one corner; sometimes she thought that the drawings lived there, not the man. I seem to be spending so little time in the house recently that my watercolors seem more natural, steady residents than I. That is why I laughed at this quote I ran across yesterday afternoon when I began reading The Fountainhead. Rand’s comments about the drawing practices of the expelled architecture student renewed my interest in drawing disciplines, and I hope to return to them this evening, after I finish this heavy preparation load for tomorrow’s art history sections. 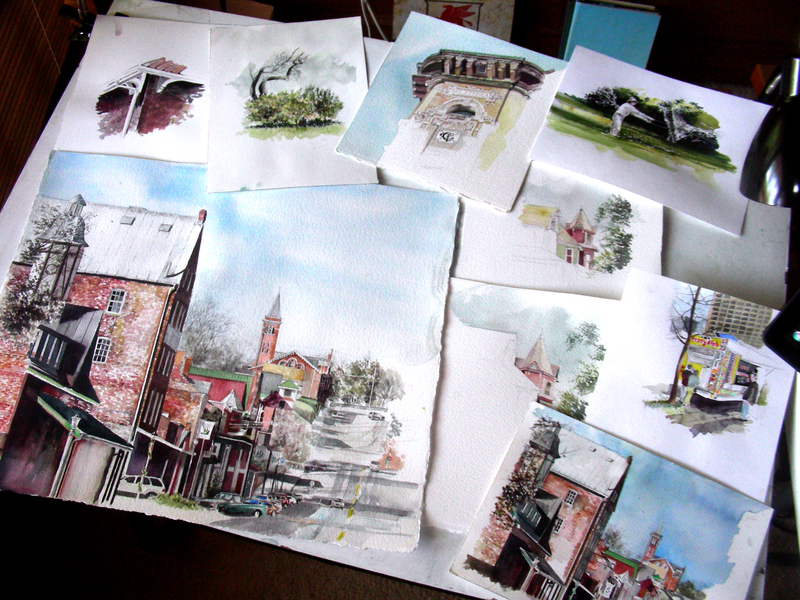 In the meantime, my watercolors and sketches wait patiently on my drafting table . . . The creative process is determined not only by the medium but also by the inner vision. I decided to come home from school over the lunch hour and begin a second watercolor sketch of the same subject as the one I attempted late last night. I titled this blog entry Palimpsest which refers to a manuscript or piece of writing material on which the original writing has been effaced to make room for later writing but of which traces remain. I could have called most of my past oil and acrylic-on-canvas paintings palimpsests, because I continued to revise and obliterate my earlier rescensions of design. 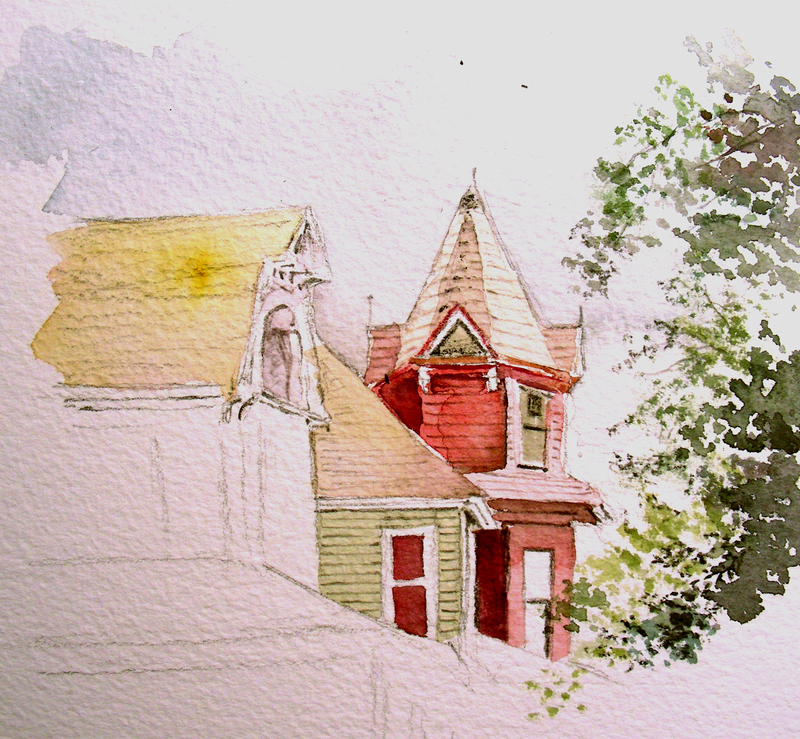 I do some of that in watercolor as well, but late last night decided to begin a series of sketches of the same Victorian house and compare them side-by-side to get a sense of what I want to do next. Next month I will begin my annual plein air excursion to Waxahachie, Texas, a German town rich in Victorian and Gingerbread architecture. This year I would like to feel more practiced and primed for those kinds of compositions that I will do on location. For now, I’m studying photos that I’ve taken over the years, hoping to improve my skills in architectural rendering and composition. Thanks for reading. I need to get back for an afternoon class. Must a painter paint everything? Can’t he leave anything to my imagination? “Lacuna” (plural lacunae) is defined as a “gap or missing part, as in a manuscript, series, or logical argument; hiatus”. I have gaps in mind as I work on a quick, quick watercolor sketch late at night, after a long afternoon of art history preparations for tomorrow’s slate of classes. I began this sketch with the deliberate intention of leaving large parts unfinished. 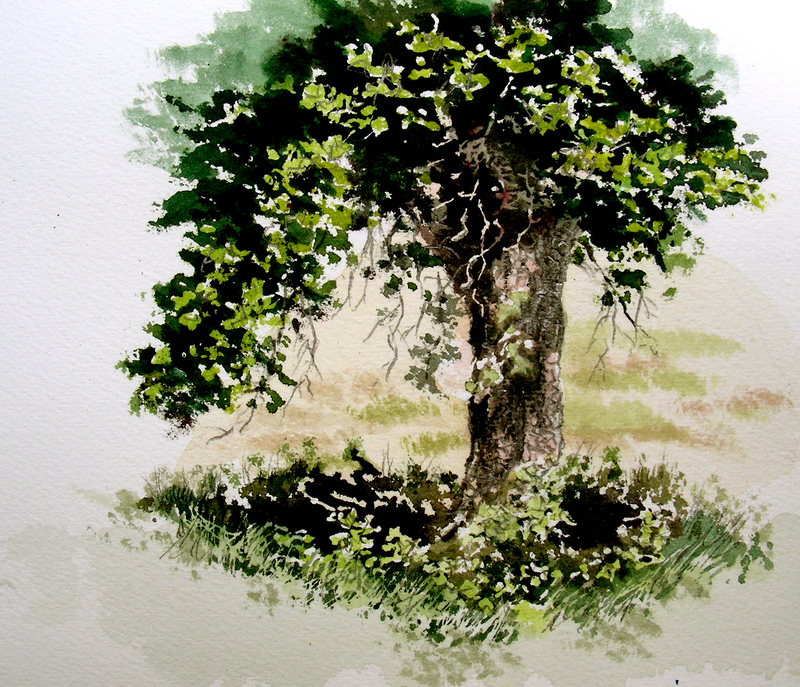 Some refer to watercolors as “vignettes” when they have undeveloped perimeters. 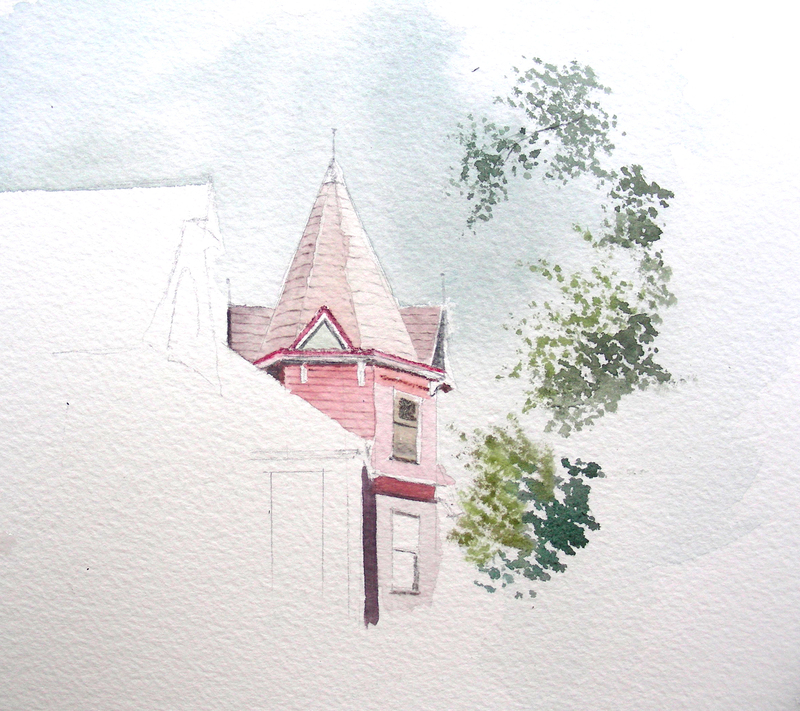 But I am thinking seriously of letting pencil work finish out much of this Victorian house I’m rendering. At any rate, I won’t “complete” it tonight. I still have more art history to prepare and the hour is getting late. In my weekend reading, I spent considerable time in Diderot’s writings. He began publishing critical articles, reviewing the annual Salon in Paris as early as 1759. I like his comment (posted above) and the way Andrew Wyeth echoed those sentiments in recent years. Wyeth always said the strength of the composition lay in what you could leave out. As one who has always enjoyed chasing and nailing down details in drawing and painting, it takes real fortitude for me to stop and walk away from a work when I feel there is so much left to be done. But tonight, being tired, and still behind in my responsibilities, I thought “Why not?” Do a quick, quick pencil and watercolor sketch, leave it, and see how it looks in the days following. Thanks for reading. I have more work to do. It is something to be able to paint a particular picture, or to carve a statue, and so to make a few objects beautiful; but it is far more glorious to carve and paint the very atmosphere and medium through which we look, which morally we can do. To affect the quality of the day, that is the highest of arts. Every man is tasked to make his life, even in its details, worthy of the contemplation of his most elevated and critical hour. Throughout this morning, while working on atmospheric qualities in watercolor, I was moved to find this passage from Thoreau that once impacted me while studying him back in the early 1990’s. I don’t pretend to be consistent in living an artful life while making art, though it is sublime when life’s details and the tasks of making art are both at their best. I can certainly vouch for a beautiful morning in the studio. 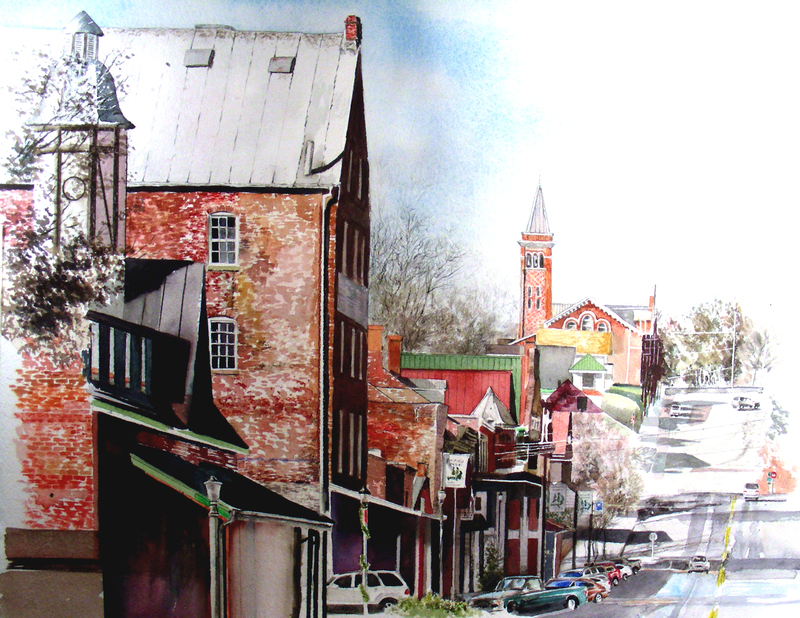 I reached a point in the Hermann, Missouri painting that I was willing to give it a rest. 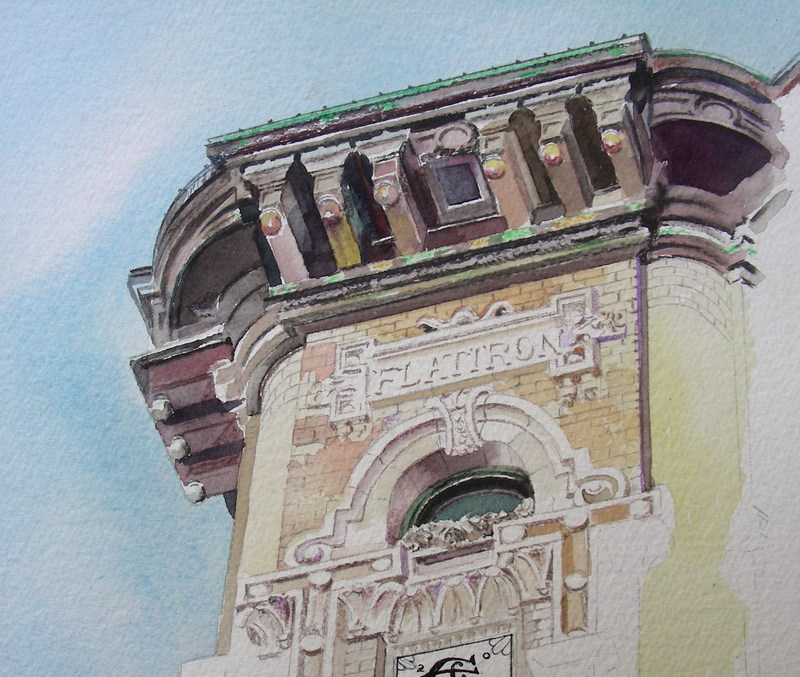 Then, without a moment’s hesitation, I pulled out this closeup of Fort Worth’s flatiron building that I abandoned months ago and went right after it. So far, the colors are working, and I am drawing, drawing, drawing. I hesitate even to refer to this as a painting. The sharp brushes are doing just as well as sharpened pencils, and I probably am feeling the same kind of satisfaction that an old-timer feels while whittling on a stick with a penknife. The more I scratch and chip away at these details, the happier I feel as an artist. I may not be too far from finishing up this work as well. The book, if you would see anything in it, requires to be read in the clear, brown, twilight atmosphere in which it was written; if opened in the sunshine, it is apt to look exceedingly like a volume of blank pages. Retiring to bed at 2:00 this morning, I was surprised to wake without an alarm shortly after 8:00. There is no school today, but the routine 6:00 alarm apparently has me waking earlier in the mornings these days, even when no such alarm is set. I came into the studio eagerly, ready to take the next step on this watercolor, but instead just sat and looked over it, in no hurry to stitch up the final details. So instead, I have been sitting in a comfortable chair with coffee, books and journal, and have set the painting on an easel ten feet in front of me in the morning light, and occasionally I look up at it, much as Andrew Wyeth did with his near-completed compositions. Wyeth would put them in a prominent place in his living room, so he could catch glimpses of them (“from the corner of my eye”, he said) as he walked throughout the house in the course of a day. Eventually he reached a decision of whether or not the painting needed further work. I suppose that is what I am doing now. Two days ago, a student whose opinion I respect highly saw the painting and thought it looked finished already. 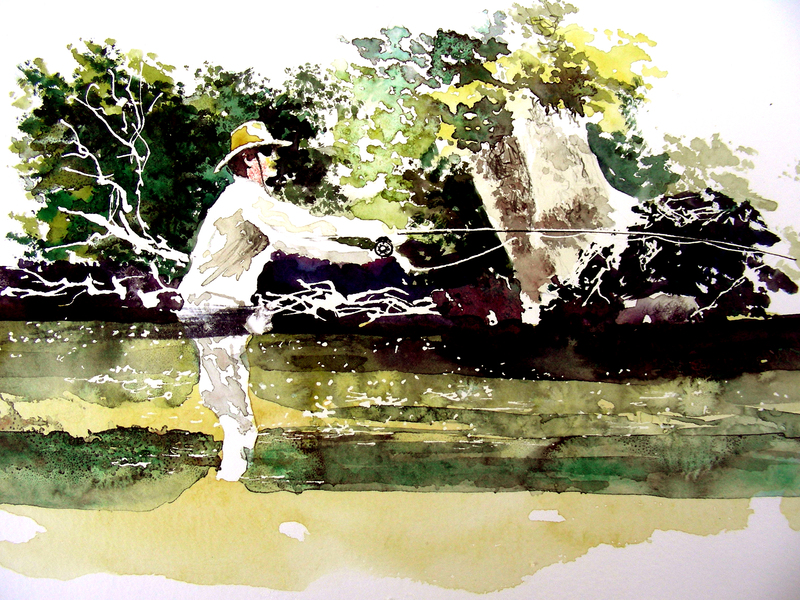 Many times I have pushed a watercolor past its completion point and felt disappointed that it had been overworked, overdone. So, I am letting this one breathe for awhile. Completed several summers ago, I found great satisfaction in the hot sun-filled composition of this piece. I was at my boldest in the use of color and sharp contrasts not only in value but in the complementary colors. Last Christmas season, when I trekked through that quaint German town Hermann, Missouri, I felt an exhilaration I cannnot describe as I took picture after picture, all the time hoping, wondering if I could possibly render a watercolor to capture the cold winter light that diffused across that cityscape, and the sense of mist that crept up from the Missouri River far down below. 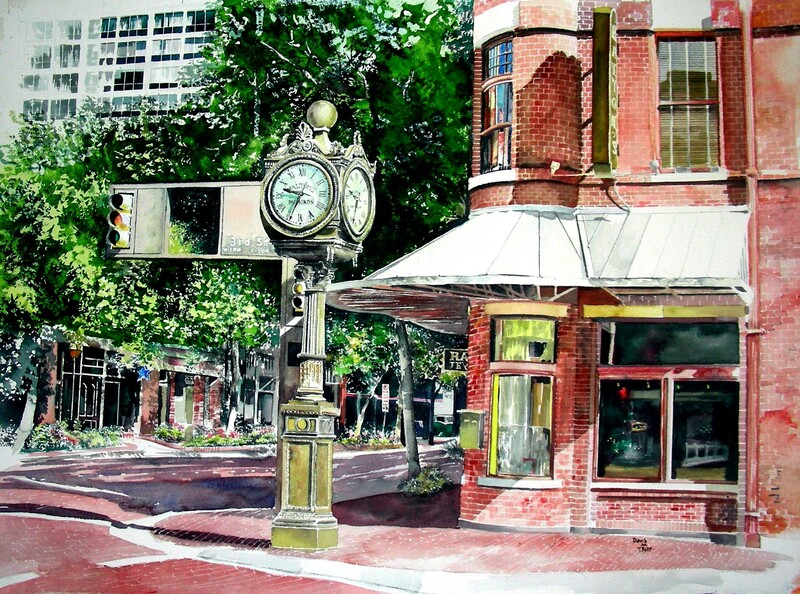 I knew that a muted, misty painting could possibly come across as boring when juxtaposed with a sharp, summer composition such as this one in Sundance Square. As the Texas summer approaches, I will no doubt return to plenty of these hot compositions. But right now, I am really loving the look of my muted, atmospheric piece, and believe I’ll continue to look at it “from the corner of my eye” and make a decision of whether to leave it as is, or look for ways to put some spice into it. Right now, I just don’t know. I have some abandoned watercolors littered about my studio, so I believe I’ll find one of them to focus on for the time being. The hour has reached nearly 2:00 a.m. There is no school for me on Good Friday. I’m feeling kind of mellow as I sit up late and work on the details of a line of parked vehicles and all the shadow changes on the pavement to the right. I’m not rushing this and can say that I’m feeling satisfied so far with how it is finishing. Hopefully I’ll have it complete before I return to school next week. Aut lux nata est aut capta hic libera regnat. The light is either born here, or, imprisoned, reigns here in freedom. Mark Rothko is an abstract expressionist painter who still intrigues me, particularly in his discussions of light in the shadows. 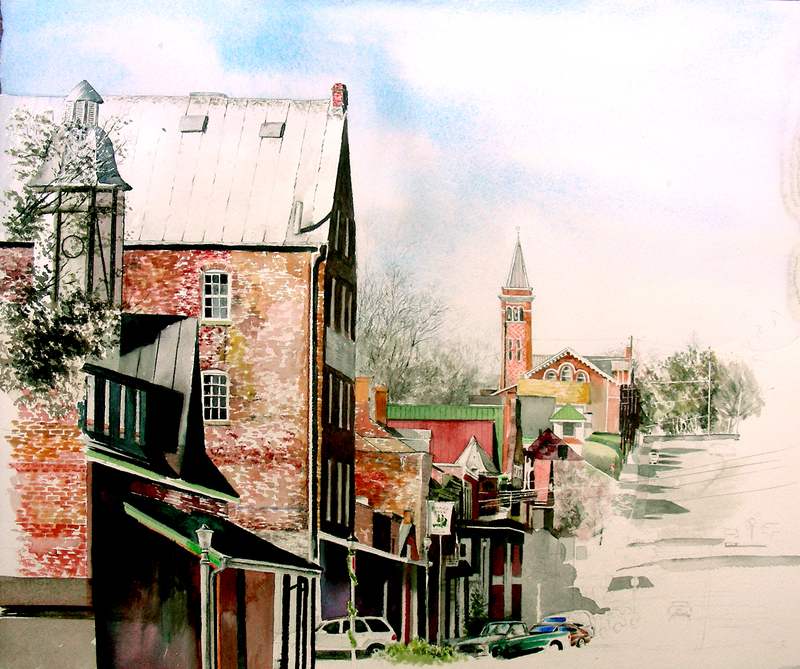 As I inch closer to completing this winterscape watercolor of Hermann, Missouri, I’m struggling with the storefront shadows and row of parked cars. There will be more shadows creeping across the street. I am not sure how it happened, but in a mindless moment, I introduced a plethora of neutral grays into the building facade shadows, and I don’t like them at all. Today I decided to experiment with some red washes over those gray regions–Alizarin Crimson, Quinachridone Red and Pemanent Rose. I then introduced some Pthalo Turquoise in the same areas, hoping to replace the gray deadness with some kind of living color. I feel that it’s starting to improve. The parked vehicles in the shade are also proving a challenge, and I’m trying not to repeat the same mistake with neutral grays. There remains a significant puddle of ugly gray above the parked vehicles that I still have not decided what to do with yet. In good time. If I Would Have to Choose a Sleepless Night . 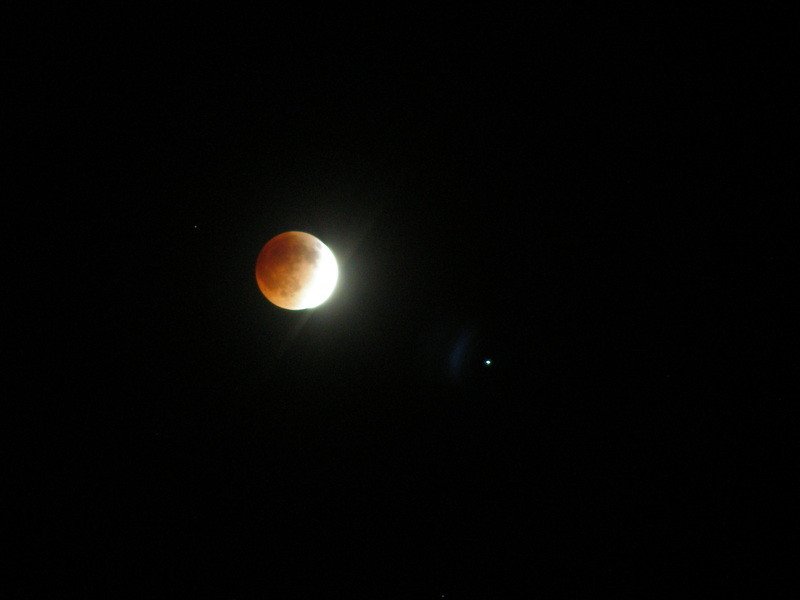 . .
Lunar Eclipse Over Arlington, Texas. 2:00 a.m.
I’ll have to rise to teach in about three-and-a-half hours. 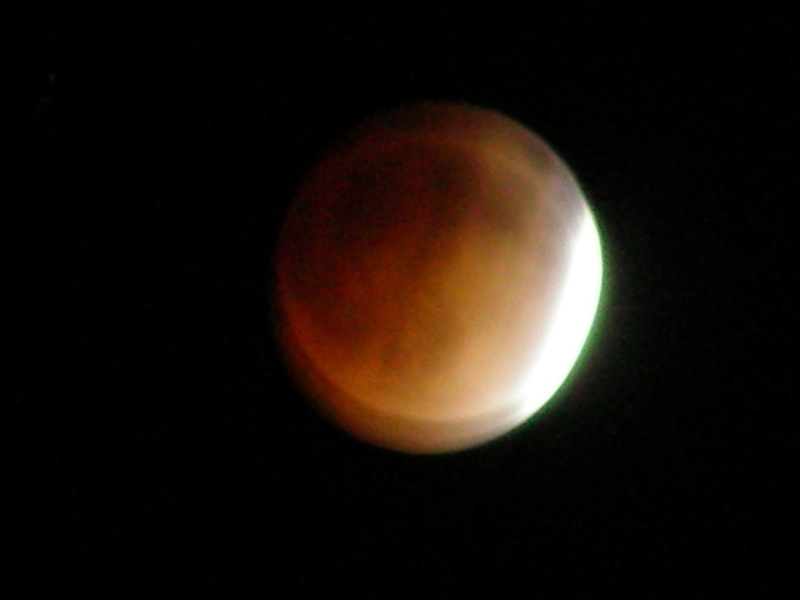 I’m still not sleepy, and filled with good thoughts about what I witnessed in the stillness of my backyard tonight.